Great face palettes can be difficult to find. Many have limited shade options that lean toward only light skintones. 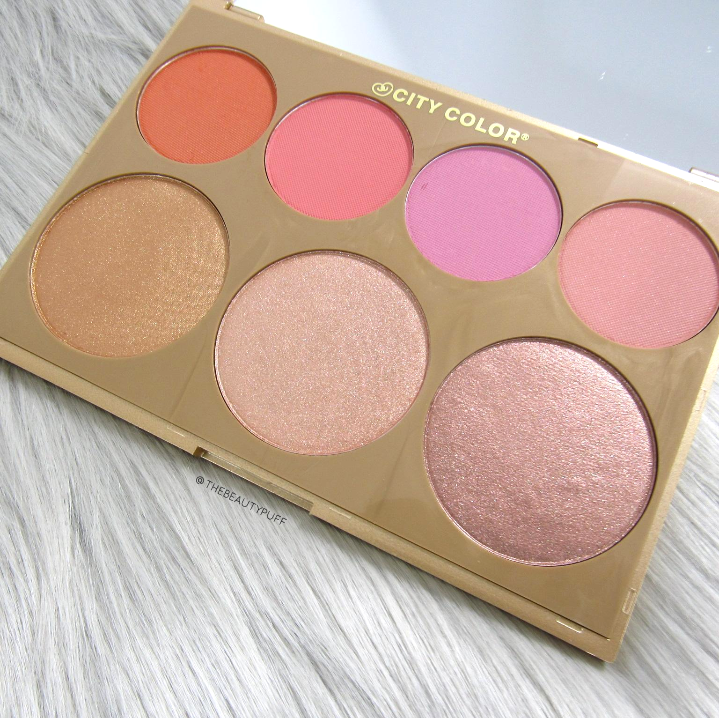 The Timeless Beauty Palette by City Color has a fantastic range of colors including four blushes and three highlighters. 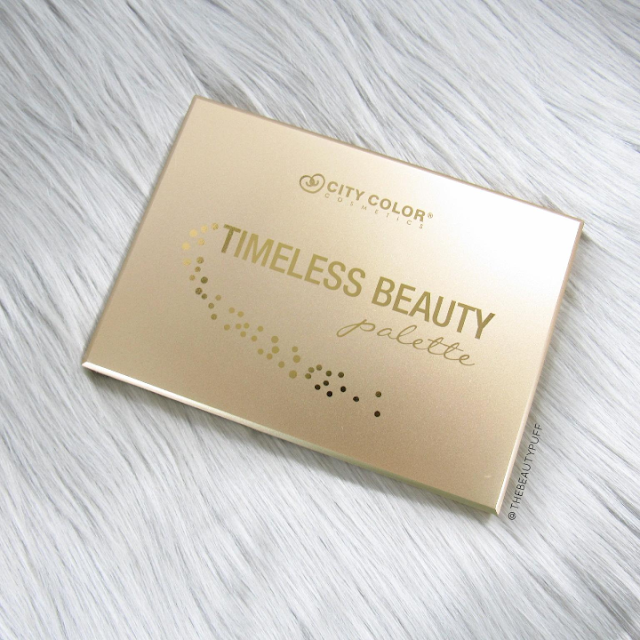 The pigmentation and longevity of this palette are fantastic considering the price point. Let's take a closer look. The palette itself is gold with a sleek, secure design which includes a full mirror. My palette in particular does not stay open with the mirror at a 90 degree angle. I don't think this is the case with all of them, so perhaps the hinge on mine was just a bit too smooth/loose. Basically it has to be held or laid flat, which is my only complaint about the packaging. *Note - there is a bit of an overspray on the highlighters, so once used, they may appear darker in photos. Inside the palette there are four blushes - apricot, medium pink, lavender and light pink. The formula is very smooth but does get a bit messy if you pick up too much product. I just use a light hand (especially with the apricot and medium pink) to minimize product fallout. They apply and blend beautifully to provide a more natural or vibrant flush to the skin. The apricot and light pink have an oh-so-subtle sheen to them, but no glitter or sparkle. Overall, they are very wearable and suitable for multiple seasons and skintones. 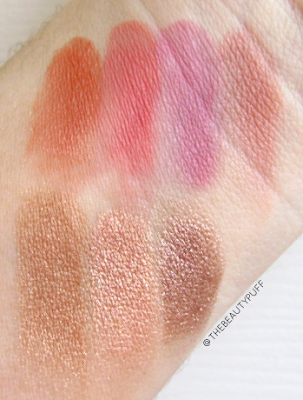 Below the blushes are three highlighters - a bronze, pink and taupe. They're really vibrant and can therefore be used as eyeshadows as well. I find this trick to be helpful especially since the deepest shade is much too dark as a highlighter my light skin. I love the gold paired with my bronzers, it gives a beautiful glow especially for the warmer months. The pink coordinates with so many of my spring blushes. I think that is my absolute favorite! Lastly is the taupe, which for my light skin, serves as a fantastic everyday eyeshadow. It really makes this palette a "one stop shop" on days I'm in a rush! The pink and taupe are particularly soft and give almost a metallic look when swatched. This palette is full of versatile shades and long-wearing formulas you'll enjoy this spring and beyond! It retails for $24.99 but you can use the code below to save on any City Color Cosmetics purchase!